Request a Product Demo with Different Roads to Learning! One of our favorite customers asked us to visit a group of special educators and speech and language pathologists at a school district in New Jersey. Natasha and I took the opportunity of a road trip to show some of our favorite products. We were both excited to do a “show-and-tell” demonstration to such a wonderful staff. We have products that are invaluable BUT you have to see and touch it to understand how it could work to improve your students or the classroom. 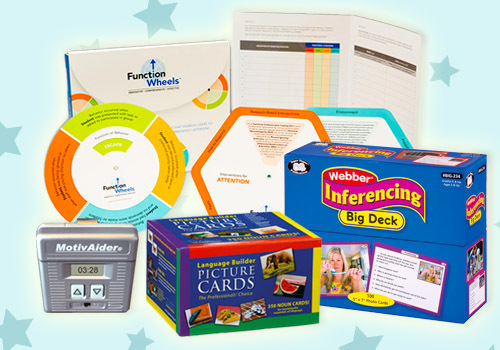 We showed our Function Wheels Behavior Kit and our ABA Curriculum for the Common Core books for Kindergarten and 1st Grade, as well as one of our bestsellers the MotivAider, the ALL PICS, and the new POWER-Solving curriculum. We passed our materials around to the teachers, and this engaged them with not only us but one another. The presentation facilitated and opened discussion amongst them as peers. It was a terrific morning. We’re willing to travel by road two hours outside of the New York metropolitan area. Please let us know if you would like us to do a product demo for a group of your SLPs or autism specialists. Written by: Different Roads to Learning on February 12, 2016. This entry was posted in Academics, autism, Products and tagged ABA, Applied Behavior Analysis, autism, autism education, Different Roads to Learning, Julie Azuma, making school visits, Product Demo, special education, special education professional, teaching tools by Different Roads to Learning. Bookmark the permalink.